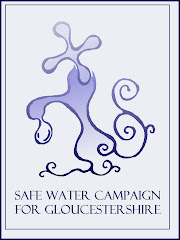 Safe Water Campaign: Fluoride damages the Thyroid, report shows. Fluoride damages the Thyroid, report shows. First-ever government review of fluoride/thyroid toxicology shows risk .2008-05-19 There is clear evidence that small amounts of fluoride, at or near levels added to U.S. water supplies, present potential risks to the thyroid gland, according to the National Research Council's (NRC) first-ever published review of the fluoride/thyroid literature. (A)Fluoride, in the form of silicofluorides, injected into 2/3 of U.S. public water supplies, ostensibly to reduce tooth decay, was never safety-tested. (B) "Many Americans are exposed to fluoride in the ranges associated with thyroid effects, especially for people with iodine deficiency," says Kathleen Thiessen, PhD, co-author of the government-sponsored NRC report. "The recent decline in iodine intake in the U.S could contribute to increased toxicity of fluoride for some individuals," says Thiessen. "A low level of thyroid hormone can increase the risk of cardiac disease, high cholesterol, depression and, in pregnant women, decreased intelligence of offspring," said Thiessen. (C)Common thyroid symptoms include fatigue, weight gain, constipation, fuzzy thinking, low blood pressure, fluid retention, depression, body pain, slow reflexes, and more. It's estimated that 59 million Americans have thyroid conditions. (D)Robert Carton, PhD, an environmental scientist who worked for over 30 years for the U.S. government including managing risk assessments on high priority toxic chemicals, says "fluoride has detrimental effects on the thyroid gland of healthy males at 3.5 mg a day. With iodine deficiency, the effect level drops to 0.7 milligrams/day for an average male." (E) (1.0 mg/L fluoride is in most water supplies)Among many others, the NRC Report cites human studies which show- fluoride concentrations in thyroids exceeding that found in other soft tissues except kidney- an association between endemic goiter and fluoride exposure or enamel fluorosis in human populations- fluoride adversely affects thyroid and parathyroid hormones, which affect bone health "If you have a thyroid problem, avoiding fluoride may be a good preventive health measure for you," writes Drs' Richard and Karilee Shames in "Thyroid Power." "My God! This is the next asbestos!